Religious leader Man Hee Lee gave a keynote speech on the topic of ‘Heavenly Culture, the essential ingredient in bringing world peace’ during the mass led by Archbishop Antonio Ledesma of the Metropolitan Archdiocese of Cagayan de Oro. At the conference with politicians and religious leaders in Cagayan de Oro, Peace advocate Man Hee Lee also delivered a speech on the topic of ‘the role of religious leaders in conflicted areas’, emphasizing the significance of the religious leaders’ parts in conflicts and disputes while Peace activist spoke about the role of youths and women in peace building. In her speech, she said, “There is no more powerful driving force than the spirit of youths and the hearts of mothers in establishing peace”, drawing an enthusiastic applause from the participants. 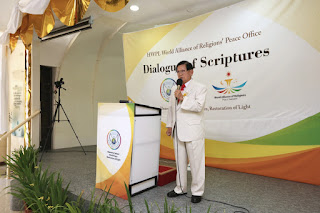 Furthermore, the WARP Office Meeting was held under the topic of “Birth, Aging, Sickness, and Death in the context of religious scriptures” Currently, HWPL’s WARP Offices are dramatically arising in 62 cities in 40 countries around the world including but not limited to Philippines, United States, United Kingdom, and India, reminding religious leaders of their significant roles in the establishment of peace.